Yangon – Sittway – Mrauk U – Flight to Sittway, welcome at Sittway airport and transfer to jetty for boating up the beautiful grand Kaladan River to Mrauk U and it takes about 4 hours cruise. Overnight at Mrauk U.
Mrauk U – Morning visit colorful vegetables market and visit Prun Zee and Kyauk-Reike village, where you can walk and see way of life. 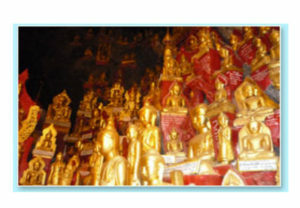 Visit Mun Khang Shwe Du (17th century) sand stone stupa. Visit Pisi ruined temple with 5 monolith images of Laymyo dynasty prior to Mrauk U dynasty. Walk through some village wher there are primitive traditional method of alcohol distillery, hats and mats, baskets, fans making home industries, they are made of bamboo and vegetable materials. In the evening, continue to library, Anorma image and sunset from Ratana Sanrie hill. Overnight Mrauk U.
Yangon – Heho – Pindaya – Kalaw – Morning Flight to Heho. 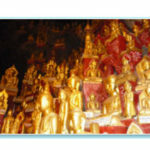 Our local guide and car will accept at the Heho Airport and proceed to Pindaya where above the town with its small lake, there is a cave housing more than 8000 Buddha images. No one seems to know how they all got there. Most of them are apparently hundreds of years old while others are recent additions. Exploring the caves at Pindaya. Then take a drive to Kalaw, a hilly station town with a pine forest. Typical old English cottages remain there in a very cool pleasant climate augmenting the pleasance with a sweet pine and eucalyptus fragrance. Right in the centre of Kalaw is Aung Chan Tha Zedi, a glittery stupa and the town market is also worth a browse with several stalls. Take a short walking tour of centre town to visit the local market and colonial buildings.Overnight Kalaw. Yangon – Kyaikhtiyo – Our local guide will pick up at your hotel in the early morning. 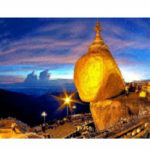 Drive to Golden Rock, a legendary miracle exists at Mon State, a merely 5 hours drive from Yangon to base camp of the golden rock and take a open truck about an hour to the Golden Rock Pagoda.You can enjoy great views and a beautiful sunrise. 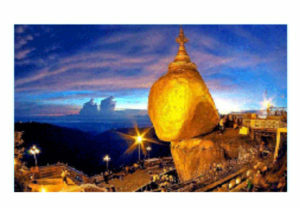 Believed to enshrine a hair relic of Buddha, the spire of 18 feet is set atop a huge boulder where the latter is balanced on the edge of a cliff. Hotel accommodations can be arranged near the Pagoda Terrace. Kyaikhtiyo – Bago – Yangon – On the way back to Yangon in the morning, visit Bago to see the pottery and the famous reclining Buddha Image. The archaeological site of an old excavated palace site is also one of the tourist attraction sites.Hintha Hill is a prominent site where Spiritual Dances can be seen especially at weekends. Can also browse the Bago market. Drive back to Yangon in the late afternoon and transfer you to the hotel. Yangon – Mandalay – Morning flight to Mandalay. Our Local guide and car will pick you up at the airport. After check in hotel, sightseeing in Mandalay Palace then take a drive to Shwe Kyaung (Golden Monastery), Kuthodaw(Merit) Pagoda where huge stone inscriptions are erected and noted to be the largest book in the world. In the afternoon, browse the “Zay Cho” (meaning fair price) Supermarke art downtown Mandalay where all commodities either local products from all parts of the country as well as Indian and Chinese products are available. In the evening climb the Mandalay Hill and watch the sunset from atop the hill overlooking the mighty Ayarwaddy River and the Sagaing Hills with white and golden stupas dotting galore. 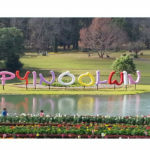 Mandalay – Pyin Oo Lwin – Mandalay – A drive to Pyin Oo Lwin also known as Maymyo and also Floral City, it’s actually a hill station resort used as a retreat for the British to escape the scorching heat in summer. It’s about one and a half hour’s drive and can come across plenty of Victorian age buildings. 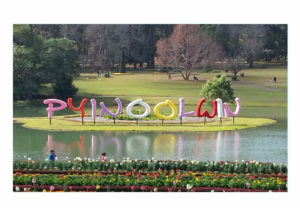 National Kandawgyi Gardens is a relaxation spot with flowers and plants galore. An only town where one can take a ride on a horse cart which resembles the stage coach in the western cowboy pictures though it’s is smaller in size. Woolen products can found abundantly and hand woven products are available at very fair prices. Overnight Mandalay. After browsing the Nyaung Oo Market, visit the nearby golden domed Shwezigon Pagoda, one of the four in Bagan where Buddha’s tooth relic is believed to be enshrined there. visit Shwe Zi Gon Temple build by King Kyan Sit. Then, explore regional products at the terrace. In Bagan, Sand-painting had become increasingly popular these days. You can find sand-paintings selling in most of the temples. In the evening, enjoy sunset at Shwe San Daw Temple where panoramic view of Old Bagan area can be seen. Overnight Bagan. 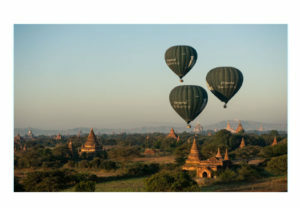 Bagan – Popa – Bagan – A day’s excursion from Bagan can be combined with a visit to Mt. Popa. The 37 nats, man-like spirits each believed up to these days to have special significance in ordinary people’s life, are intervened with many aspects of how religion is practiced in Myanmar. Overnight Bagan. Bagan – Yangon – At convenience, conferring with the station guide,.suggested sites are….. Thatbyinnyu, known as Temple of Omniscience from1144…..Dhammayangyi, the most massive temple dating 1170….Lacquerware workshops and Buphaya on the bank of the mighty Irrawaddy River….Manuha Phaya , portraying His captivity as a POW while building the Pagoda is also an interesting site with Nanphaya adjacent to the former. Fly back to Yangon in the evening and transfer you to the hotel. Yangon – Thandwe – Ngapali – Morning flight to Thandwe and the car will transfer you from the airport to the hotel. Overnigh Ngapali beach. Ngapali – Thandwe – Yangon – Fly back to Yangon in the late afternoon and transfer you to the hotel in Yangon. 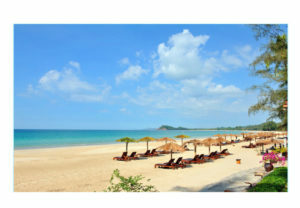 Yangon – Ngwe Saung beach – Car will pick up at your hotel in the early morning. Approximately 5 hours drive from Yangon, depending on the road conditions. Also bluish water and pristine white sand, an opportunity to gaze at the Mighty Indian Ocean. On the way, can drop in at Pathein, where traditional parasols galore fetching a name to the city for this products. Overnight Ngwe Saung. 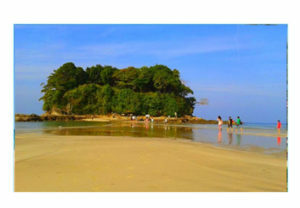 Ngwe Saung beach – Yangon – Drive back to Yangon in the afternoon and transfer you to the hotel.